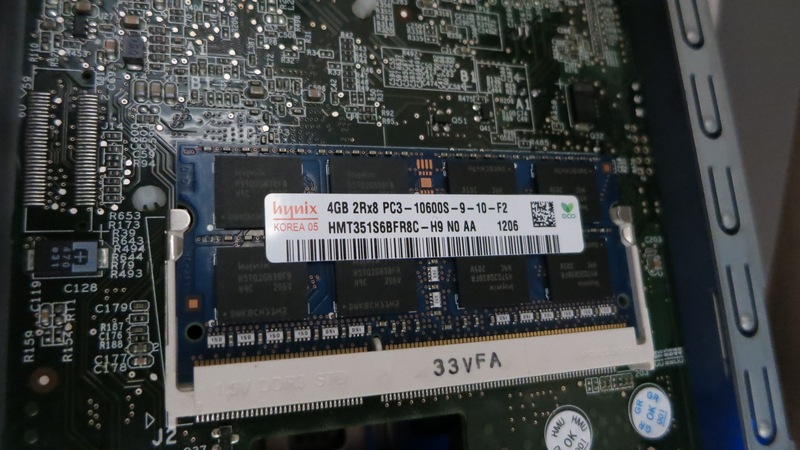 The 2GB of RAM that is standard in the RN300 series of NAS from NetGear might seem like a lot to begin with, but if you install additional applications such as media servers or backup software (see this post for instructions how to install CrashPlan), memory might become a scarce resource. For example, CrashPlan needs about 1 GB of RAM if you have lots of files to backup (> 1 TB I believe). As I had a 4 GB DDR3-10600 SODIMM laying around, I figured I would try it. Maybe it would work… and it did! Turned out to be a 1 minute operation. Just turn off the NAS, pop off the left sida panel (seen from the front), exchange the 2 GB module for a 4 GB one, put the panel back, and start the NAS. Success! Looks like we have 4 GB RAM in the system now – nice! I will dig around a bit to see if some other settings need to be updated, but so far so good – everything seems to be working just fine. System volume ‘root’ usage is 81 %. This condition should not occur in normal conditions. Please contact technical support. Ouch… Well, it is easy enough to move the log and rrd files to a better location. As this problem is likely to occur for most software installed on the NAS, I decided to make a directory /home/admin/from_root, where things that originally lived on the root partition can be moved. Now start the service again, using the second shell. You can now monitor the startup log entries, and if all goes well there will be no (serious) errors. Edit: Some additional configuration turned out to be necessary to achieve stable operation, see this post. 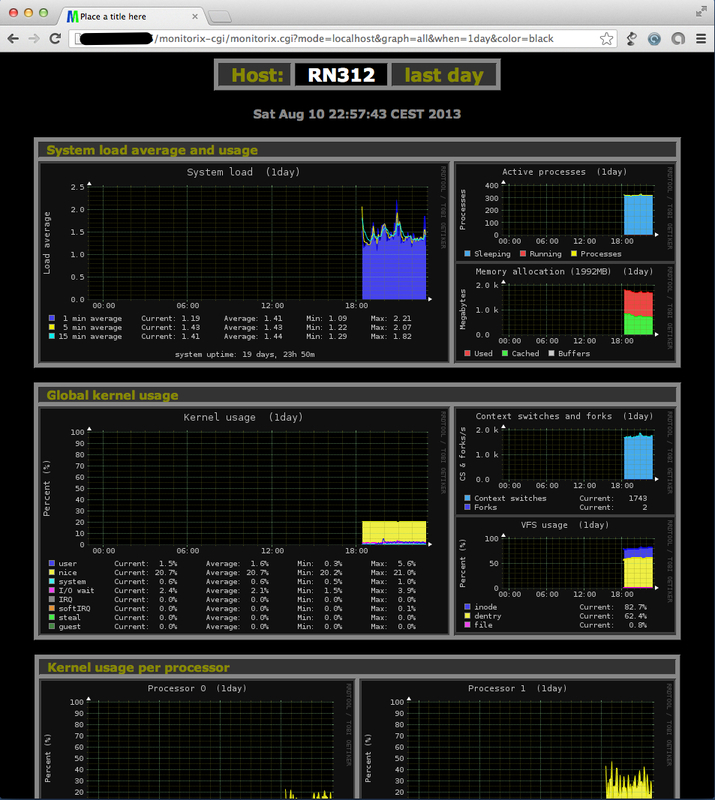 The built-in monitoring of the RN312 is ok for basic purposes, but still pretty limited. I am really heading towards a Zabbix setup (I think at least, having tested it in a VM environment it seems pretty nice), but there is A LOT of configuration needed to get Zabbix up and running. That’s actually a downside of Zabbix: In order to get simple things like alarm/notification emails set up, you need to do a lot of configuration in the web UI. Yes, it is very flexible, but also quite demanding. So what options are there to get started more quickly? Wikipedia lists a whole bunch of NMS systems. 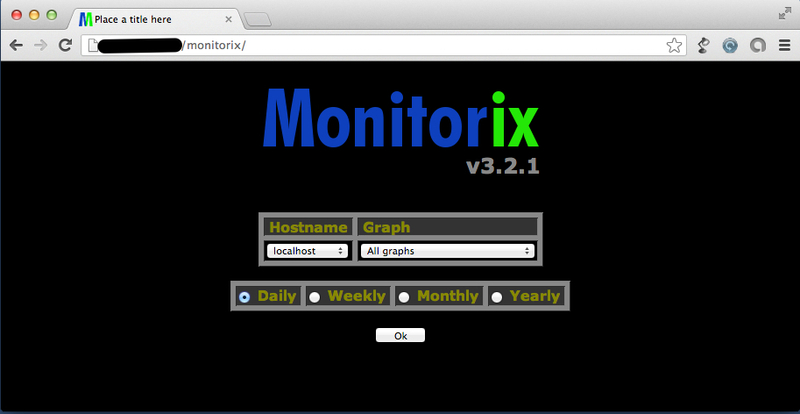 Having following (and read good things about) Monitorix for some time, it was worth a try. Setup was pretty painless, but some extra work was needed (as compared to the installation instructions). Good instructions for Debian can be found here though. Worth noting that I decided to install packages from a repository, rather than as a downloaded package, or from source. Add the needed sources. Good instructions here. I stored the repo key in /root, there is probably a better place for it… Btw you need to do the following as root, so run “su” to change user. Get the key for the repository. This is needed in order to install the package from the repo. Yes…. You should probably not allow anyone to access via insecure http… Better option might be to use specific IP numbers, instead of all. I.e. “Allow from w.x.y.z” instead of “Allow from all”. Edit /etc/monitorix.conf. By default Monitorix’ own http server is enabled, but it will clash with the Apache2 server that is already running on the RN312. We need to disable Monitorix’ http server, and while we are at it, you might also want to change the hostname, as well as decide which graphs to show. For some years now I have tried to improve my Linux skills. I just don’t have the time to do Linux deep dives at work, so I figured I would set up a physical Linux box here, in addition to the VMs I use from time to time. Anyway, without further thought about the pros and cons of VMs vs physical machines, creating the installation USB thumb drive turned out to be a bit of a challenge, until UNetbootin and LiLi came along. The former supports Windows, Linux and OS X (I am on OS X), while LiLi is Windows only. LiLi looks good, but given my OS X preference I went with UNetbootin. After creating a Debian Wheezy installation thumb drive, I tried booting it in a Dell laptop. No luck, it booted straight into the Windows 8 that was on the hard drive. When repeating the procedure on the Dell laptop (running Win 8) it worked like a charm, the Debian installer started after the USB drive had been created, and the laptop rebooted. I recall reading somewhere that there are issues with UNetbootin on OS X, I guess that’s still the case.. So, now onto the actual installation – nice! After creating a few new users on the RN312, using the web interface provided with the device, I noted that none of the users could ssh into the NAS. Turns out the new users are created without a default shell, resulting in a successful ssh login, followed by a terminated connection. No good. Firmware 6.0.8 just became available for the x86 based Netgear NASes. Interestingly enough, it is called “firmware” version, but to me (and others familiar with electronics and embedded systems) a firmware is low-level software running directly on the CPU/MCU. Maybe there are such components in the Netgear firmware too, but most part seems to be just updates to the NAS’ Linux environment (or more specifically: to the Debian Wheezy packages). Anyway, that’s mainly semantics. My worry was that the upgrade would overwrite the 3rd party software I had previously installed (htop, tmux and CrashPlan). Turns out there was no need to worry. All three works flawlessly also after the “firmware” upgrade. Nice. If you spend any time at all at the Linux command line, you need tmux. Period. It makes you orders of magnitude more effective, there’s just no excuse for not using it. That’s it. Copy in your favorite ~/.tmux.conf file, and you are set. Just a quick post on how easy it is to set up the invaluable htop package on the Netgear RN312. For those not familiar with htop, it’s a super-powered process monitor, way way better than the old legacy top command. Nice stuff, must have. Turns out the pre-built package for htop is borked though (apt-get install htop fails) . Bummer. Time to pull out the command line magic..
configure: error: You may want to use –disable-unicode or install libncursesw. … and that does it. Enjoy htop on your x86 based Netgear ReadyNAS! CrashPlan on Netgear ReadyNAS RN312 – hello! Edit: Installing according to the instructions below works, but it does place CrashPlan’s log and cache files on the very size constrained root partition of the ReadyNas. Especially the cache files will quickly fill that partition of you have lots of files. It is however easy to move those cache and log files to a better location, so once done with the instructions below, check out this post for details on how to move cache and log. I’ve been using CrashPlan for a couple of years now, it’s a great service. In particular I like the peer-to-peer backup feature, where I can configure my parents’ (or friends) computer to back up to my small headless server during the night, making sure they don’t loose their pictures due to some unfortunate keyboard sequence.. The paid-for service is very reasonably priced too, giving me unlimited backup space for $4.79/month, given a 2-year signup period. Nice. www.shasam.net has been invaluably helpful, providing general ideas on how to approach CrashPlan on ReadyNAS:es. Still, as the instructions there doesn’t work for the RN312 series, I feel it might be useful with some additional comments. On the RN312 (using the standard web UI), create a share named “Crashplan”. It will be stored under /data/Crashplan Enable ssh root access (once again, using the standard UI). ssh into the NAS, using something like ssh root@192.168.1.x, adjust the IP address as needed. Use the pwd of the admin user, that you set when configuring the NAS. You must review and agree to the EULA before installation. Press enter to read the EULA. With this, it should be a smooth ride following the previously mentioned blog post to set up CrashPlan. Worked for me, a few hours later the RN312 has now backed up a few GB and progressing nicely. The full backup will take weeks or more, but that’s fine – the summer is long and I have other backups in place meanwhile.